Western persimmons were introduced to California from Japan (by way of Commodore Matthew Perry) in the 1870s. Tomato-shaped Fuyu persimmons, eaten when firm, ripen just in time for a bright autumnal orange salad. Care should be taken if attempting this recipe with the softer Hachiya, or other astringent type persimmon which can be found in markets well into the winter. 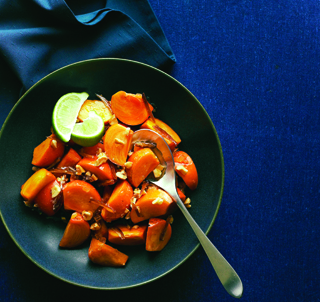 Toss persimmons with dates and cashews in a medium bowl. 20 seconds. Whisk again, then drizzle on salad and toss to coat. Serve with lime wedges to squeeze on top. Excerpted from The Sunset Essential Western Cookbook (Oxmoor House). Copyright © 2012.